Reluctant E-retailers: What’s Keeping China’s Big Chains Offline? Is setting up shop online in China an unrewarding endeavor? For years, the country's offline stalwarts believed so. Despite burgeoning Internet usage nationwide, the business case hasn't always added up for bricks-and-mortar retailers to invest in websites and figure out how to make them turn a profit. But on April 20, Gome, one of the country's largest electronics and home appliance retailers, joined the virtual ranks with a new online shop. Gome's online debut — a belated one, some tech experts observe — comes at a time when the intensity of competition among business-to-consumer (B2C) e-commerce providers in China is changing rapidly. Up until now, only a handful of offline heavyweights have had a presence online. But even among those, the general lack of conviction is striking. Internet research company iResearch says that of the 30 largest Chinese e-commerce firms in terms of revenue, 26 are pure-play Internet firms; in comparison, only five of the top 30 in the U.S. are pure plays. Other research shows just how tough competition in China is for new entrants. In 2010, Taobao Mall, Jingdong Mall and Joyo (Amazon in China) accounted for 42.5% of the B2C market, according to Analysys International, a market research firm. The best-performing traditional retailer, Suning — Gome's main rival — had a market share of less than 1%. Hundreds of other players are tussling for the remainder of the market. Yet offline retailers have numerous strengths that could be turned into competitive advantages, according to a recent CCFA report. That includes longstanding relationships with suppliers, which help guarantee product availability and quality and gives traditional retailers substantial leverage when negotiating lower prices. National retail chains also have extensive logistics networks and great brand awareness and trust among shoppers. Moreover, they have honed their customer relationship management, including after-sales services. Part of what's holding back offline retailers, however, is that while e-commerce may be growing fast in China, it is still a minnow, according to McKinsey. Having nearly doubled to RMB 513 billion (US$78.8 billion) from the previous year, online revenue in 2010 was only 2% of the total retail market. Investing in the unknown — to develop new capabilities, teams and business models — is not trivial. The CCFA calculates that traditional retailers embarking on new online stores need to invest around RMB 30 million in start-up costs alone. 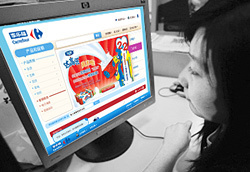 With online profitability proving to be elusive for most retailers, that RMB 30 million could be money down the drain. In comparison, a new physical shop with the same amount invested can usually turn a profit within three years. The CCFA's research also found that a major shortcoming among many offline retailers going online is how IT is managed. Rather than developing dedicated online IT teams, many traditional retailers redeploy their existing IT manpower, despite the fact that they might not have the requisite skills to launch and maintain complex online functions such as order processing, payment processing, customer monitoring and statistical analysis. The information systems themselves also often lack critical e-commerce functionality, like the ability to provide real-time — or close to real-time — inventory management. In contrast, IT specialists are at the heart of pure Internet retailers. At Yihaodian, for example, 200 technical staff are working on systems serving the firm's eight million registered users nationwide and its vast network of suppliers and distributors. With revenue growing from RMB 4.17 million in 2008 to RMB 805 million in 2010, it is also now building a new IT research and development center in Wuhan, central China, and will hire an additional 400 employees more this year. Another major issue is logistics. While most offline retailers only have limited involvement in logistics since it's their suppliers that are responsible for delivering goods to their stores, it's another matter in the online world, which requires the shopkeepers themselves to manage the delivery of their goods to customers' doors. For that reason, ever since Suning went online in 2006, it's been building an e-commerce-enabled logistics network to help it meet its ambitious online sales targets. According to the CCFA's Yang, that's been a key reason for the success of Suning, whose online revenue is forecast to increase to RMB 5 billion this year from RMB 1 billion (out of total group sales of RMB 75 billion) in 2010. In the next five years, it expects online revenue to reach RMB 60 billion. As of the end of 2010, Suning had four logistics bases, 10 under construction and agreements have been signed to begin building another 17. It's aiming to build 60 centers between 2013 and 2015. To reach similar scale, other retailers often have to hand their logistics over to third parties. However, experts say such outsourcing isn't without risks, particularly since delivery specialists are less reliable the further outside the country's larger cities that a company operates. Alongside logistics, marketing also often needs an overhaul. “Offline retailers essentially rely on the location of their stores for marketing,” says Jeffrey Wong, CEO of Meici.com, a Shanghai-based online luxury store, with revenue forecast to double this year from around RMB 30 million in 2010. “This is particularly true of department stores, which dominate central shopping districts in Chinese cities." But for luxury goods, traditional retailers have one major advantage over their online rivals — their stores allow customers the chance to touch, feel and try on items before making a purchase, something that's generally considered important for high-end retailing. “One of the biggest challenges for us is that we have to make sure our customers enjoy a luxury experience online as well, which requires a new way of managing customer service,” emphasizing convenience and price competitiveness, says Wong. Dixit also cites a recent McKinsey survey in which three-fourths of the Chinese 15,000 consumers polled were 34 or younger, while over half were middle or upper class and had university degrees. However, despite being wealthier, online shoppers expect low prices. That makes pricing strategies particularly tricky for offline retailers moving online. If a traditional retailer cuts its online prices dramatically, there is the risk of jeopardizing, or "cannibalizing," their offline businesses. Marketing partnerships with existing e-tailers is also a key for the online ventures of traditional retailers. For example, not only did Suning partner with IBM to develop its web site initially, it also enlisted Baidu, China's largest search engine, to generate online traffic. Meanwhile, Uniqlo, a Japanese casual wear chain, had built its brand presence in China with physical stores over several years before entering into a partnership with Taobao, the country's largest Internet retailer. Uniglo tapped Taobao's expertise and customer base, helping its online venture attract more than 400,000 visitors in the first 10 days after launching on April 16, 2009. Experts say retailers may face greater complexity as they go online, but they'll also have more opportunities to grow. A case on point is the vast amount of information retailers can collect from e-commerce customers. On the one hand, this information can be harnessed to customize ad campaigns online, which is the "golden chalice" of marketing, according to Dixit of McKinsey. On the other hand, the information can also inform offline business decisions. Lancôme, a French cosmetics firm, for example, monitored the IP addresses of online customers in China, which told them where there was most demand for their products in the country. Such insight helped it decide where to open offline shops. Yet there are larger, often thornier, strategic issues that need addressing. Vvivi Hu, founder and CEO of Zwzhome, a Shanghai-based homeware e-tailer that has been up and running since 2009, says a key question for traditional retailers is whether their online ventures need to be a revenue generator in its own right or are they marketing tools. It could be argued that e-commerce isn't entirely alien to traditional, but rather they just haven't figured out yet how to leverage their existing offline advantages online, according to the CCFA's Yang. Even so, retailing can no longer take an either-or approach, he says. Successful retailers in the future, he predicts, will be those that are masters of both their online and offline shops.